A friend of mine is going to have an orange wedding with rose as the main wedding flower. This post is meant to give her some ideas and inspirations for her wedding. I am going to post some ideas for orange rose wedding arch, centerpieces, invitations, bouquet and guestbook table. Orange is a very common color for summer and fall weddings so I hope you can get some inspirations for your own wedding from here. As roses are quite inexpensive and sturdy enough for wedding decorations, my friend plans to make all of her wedding decorations out of roses. These beautiful invitations are from Weddingpaperdivas. They have a very pretty collection of orange wedding invitations, I chose the ones below as they are suitable for a formal themed wedding featuring orange roses. 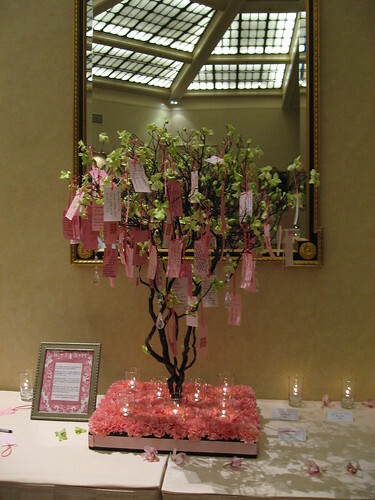 My friend wants to have a wedding tree as an alternative to a traditional guestbook. She wants to have a living mini-tree that everyone could write notes and hang on it. She also plans to have small orange rose vases on both sides of the wishing tree to add some orange touch to the guestbook table. For an orange rose wedding, the wedding bouquet doesn’t have to be made of only orange roses. Flowers used often are orange roses, white roses, white orchids and calla lilies. I love the addition of some hypericum berries to liven up the bouquet.